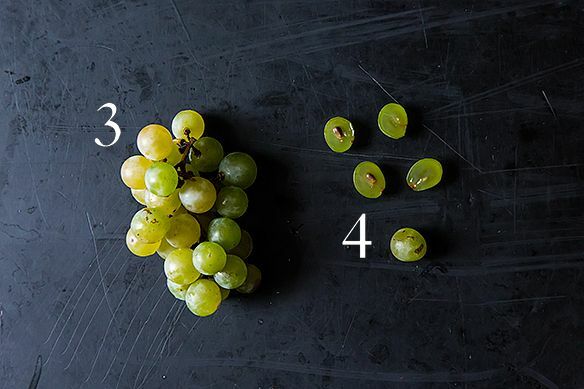 How many types of grape are there? If you answered two -- "red" and "white," aka purple and green -- well, you're not the only one. 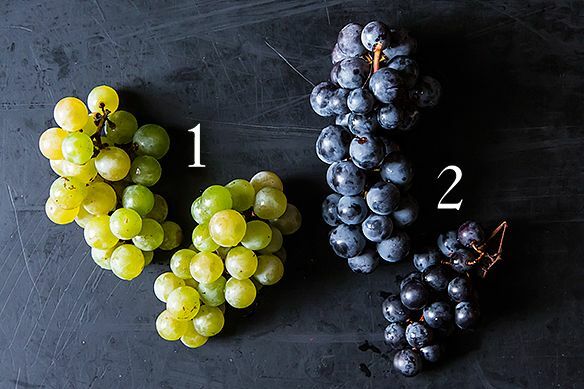 In reality, there are hundreds of grape varieties used in wine-making, but even at the best farmers' markets you'll only find a handful of different types of "table grapes," as the snacking varieties are called. 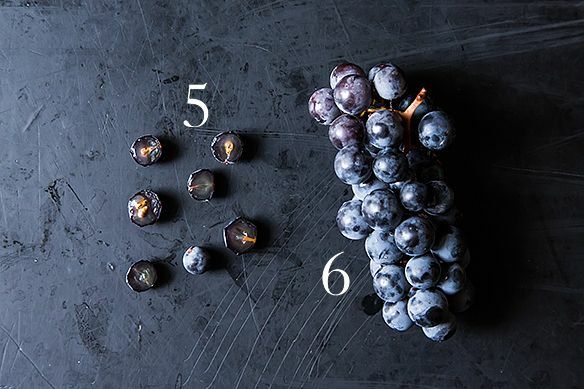 Wine grapes are a world unto themselves (a world that perhaps dymnyno can tell us more about) but today we'll be sticking to table grapes, which have thinner skins, more flavor, and less sweetness -- all of which make them best for eating raw. And of course, don't forget to submit your recipes to our Your Best Grapes contest! 1. "White" Grapes - Remember learning that nectarines are actually genetically hairless peaches? Similarly, green grapes formed from a genetic mutation of purple grapes. When two genes that control anthocyanin (a molecule that causes a purple/red color) are turned off -- voila! Green grapes. 2. "Red" Grapes - Purple grapes can be found in shades from reddish-brown to the deepest indigo. There are countless varieties, but because most of them have seeds they generally aren't sold in grocery stores. (Hence the popularity of cultivars like Thompson's Seedless.) Farmers' markets are your best bet! 3. Cluster Theory - Grapes grow tightly spaced together on offshoots of a single thin branch. If you've ever driven past a vineyard and seen grape plants elaborately pruned to fit trellises, it's because left to their own devices, they'll grow more fruit clusters than they can reasonably support. This yields a poor harvest and weakened plant stock -- pruning is done for the greater good! 4. Seeds vs Seedless - In a strange way, grape seeds are practically obsolete: grafting is as common a way to create new grape plants as actually sprouting them from seed. Nevertheless, seeded grapes still exist and while wine-, juice-, and jelly-makers can just strain them away, we snackers have to deal with them one-on-one. Just spitting them out may be the easiest method (although grape seeds are both perfectly edible and chock full of nutrients). If you're hoping to top a galette or fill a quickbread with grapes, though, our advice is to sit down with a paring knife and get comfortable -- the seeds are easy enough to flick out once the grape is halved, but it can be slow going. 5. Thick-Skinned - Concord grapes are a "slip-skin" variety -- if you've ever bit into one, you'll be familiar with how the thick skin falls away from the squelchy insides. It's not a good or a bad thing, just another attribute that grapes can have. 6. The Welch's Mystery - If you've ever been a child, you've probably had grape juice. And if you've ever had grape juice, you've probably wondered why it bears no resemblance in taste to the grapes you get in stores! 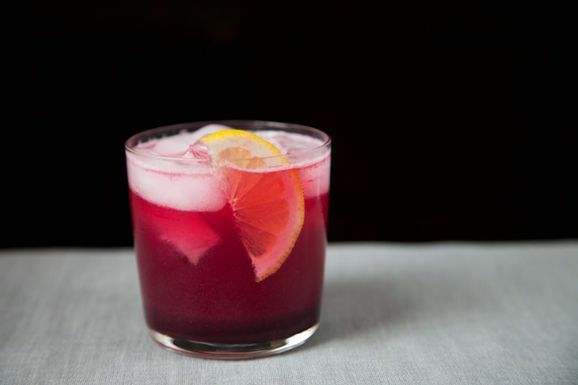 Wonder no longer: Concord grapes are the answer. Developed in the late 1800s in Concord, Massachusetts as an ideal cold-climate grape by Ephraim Wales Bull, Concord grapes represent about 8% of the American grape harvest. Because of their fragile, loose skin and seeded interiors, you'll rarely find them outside of farmers' market -- most Concords are made into grape juice, grape jelly, and hilariously, grape soda. If you've never had a Concord grape, you're in for a treat. They're like an all-natural version of packaged fruit snacks! Grapes are wonderful to cook with because they provide both moisture, flavor, and texture. Grapes roasted with sausages are a classic, although you can't go wrong with adding a handful to your next chicken salad, or using them to top a focaccia. How do you cook with grapes? Wow.. I had NO idea that green grapes were just the purple variety minus the anthocyanin..Kind assumed that they were like carrots & potatoes.. different varieties.. Yet another awesome down & Dirty topic!!. Thanks!